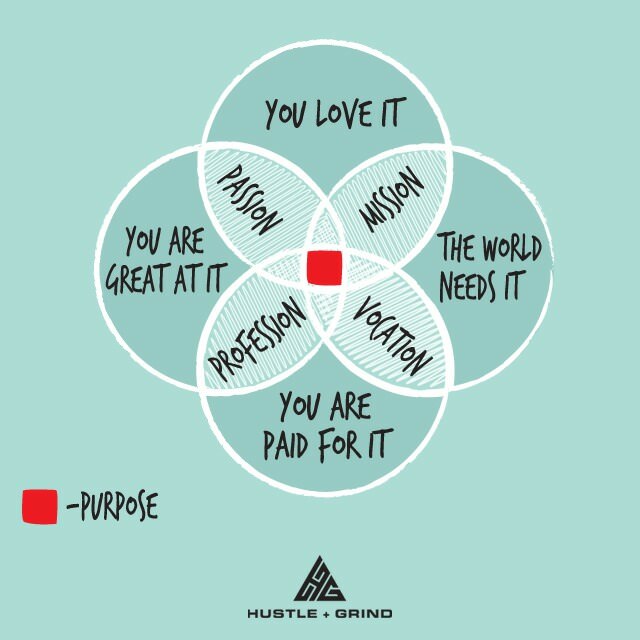 How to find your purpose in life? The Venn diagram below has appeared several times on the social networks I use. In my opinion it is very interesting and makes me think, so I would like to share it with you and make some personal comments. Probably there are many things that we love but that we are not great at. But the opposite is not true: I don’t believe we may be great at something we don’t love. I think that nothing is more effective than enthusiasm. Thus in the Venn diagram above, all the things we are great at should fall in the intersection with the things we love. I talk more about that in my post about the 10,000 hours rule. On the short term we may be paid to do something even if we are not great at it. But on the long term we will only be able to hold a good job if we are great at it. So on the long term there is always an intersection between being great at and being paid for something. Moreover, being great at something is not simply a status we reach and then enjoy. Being really great requires continuous improvement. I believe that if we are being paid for something it is because the world needs it. Thus all the things we are being paid for fall in the intersection with the things the world needs. Of course there are lots of people working as volunteers on things that the worlds needs. But I also believe that if there is something that the world needs, there will always be someone willing to pay for it. All the things we are great at fall in the intersection with the things we love. All the things we are paid for fall in the intersection with the things we are great at. All the things we are paid for fall in the intersection with the things the world needs. It is also important to spend time with people you enjoy at work. After all, that is where you spend most of your time.